Download Catalog #51 PDF: Click to download (requires Adobe Acrobat Reader). Printable in B&W or color! 1910 Montblanc 2K “Simplo Pen Company” Safety eyedropper-fill in BHR. Cap signed “Mont//\\Blanc,” with correct white cap top. Correct nib: “SIMPLO PEN COMPANY 2 NEW YORK" (medium, extra-flexible, italic). 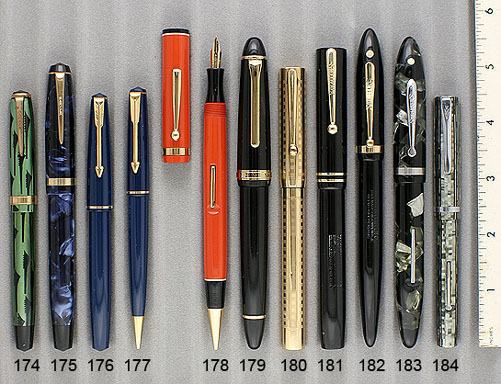 In their early years, Montblanc imported their nibs from Collins in the US and from Perry in the UK. Pre-Star Montblancs are very rare. Wear to the turning knob imprint, and the slightest ambering, otherwise near mint. 1920 Waterman 58 LF in Cardinal. Large and beautiful! Crisp barrel imprints. Fine, extra-flexible (copperplate) nib. Some clip and band brassing and a few surface scratches. The barrel is one shade darker where it is covered by the cap. Otherwise near mint (may never have held ink). 1929 Waterman Patrician LF in Jade. Outstanding, mint color!! GFT. Medium, flexible nib, with a touch of flex. 1932 Montblanc C-III BF in Lapis (very rare). Strikingly beautiful color! GFT. Rare, bandless model. Some darkening and the slightest shrinking at the center of the cap tube, otherwise near mint. 1943 Waterman 100 Year LF Set in Solid 14K Gold. Extremely rare, especially in new-old-stock, mint condition. 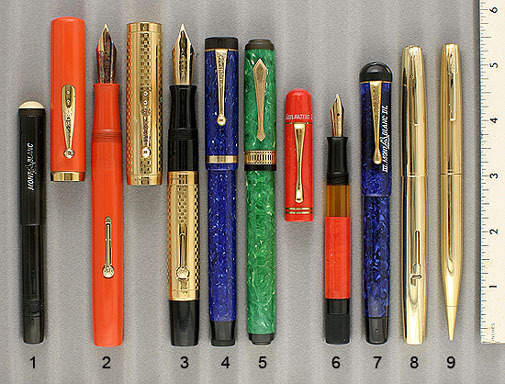 Waterman introduced their clutch equipped slip-cap pen to compete with the Parker 51 which was so popular at the time. Medium, flexible nib. 1943 Waterman Pencil for above set. The roots of Pelikan can be dated to 1832, when Carl Hornemann started producing paints. In 1871 he sold his business to Gunther Wagner. Wagner used his own family crest, a Pelican feeding four chicks, as the company logo. 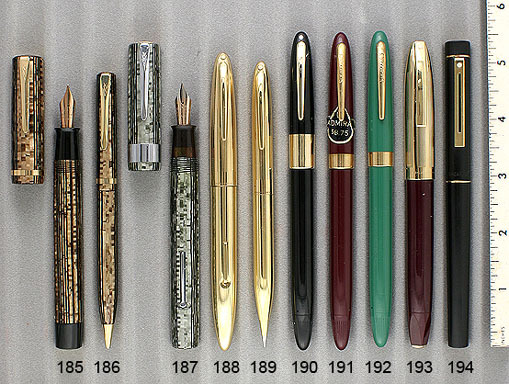 The Pelikan factory produced a huge number of stationary products. 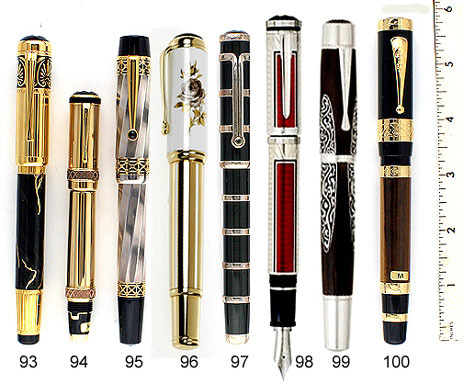 They started studying fountain pens in 1925 and were determined to improve on the pens in the market which relied on filling the barrel with an eyedropper or using a bladder. 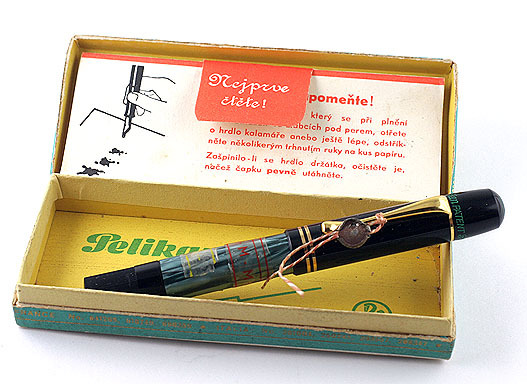 By 1929 Pelikan had developed and introduced the world’s first piston-filling pen! 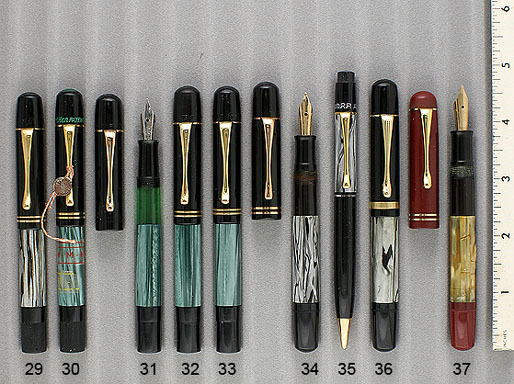 The Pelikan 100 sold well, despite the Great Depression. Other models followed, all using the same differential piston filling mechanism. 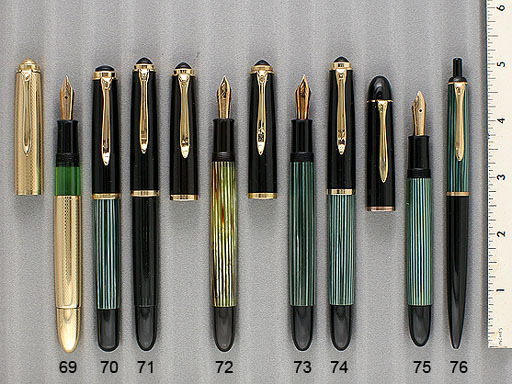 Export models, and models produced in Pelikan factories located outside of Germany, produced an array of colors and styles not sold in Germany, many of which are very rare today. 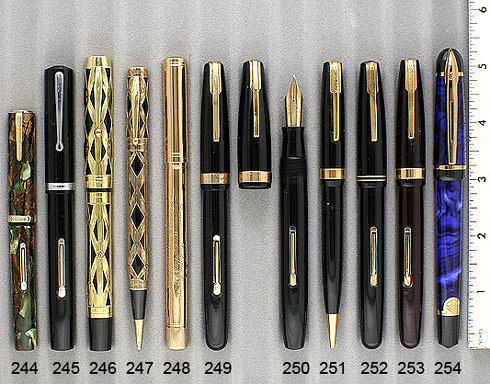 Among the rarer Pelikans are pens marked “Emege.” These were pens made for export to Portugal. The name of the Portuguese licensee was Monteiro Guimaraes. His initials are “M” (eme) and “G” (ge). He was tired of fixing pens under warrantee which were not bought from him, so he had “Emege” imprinted on all the pens he imported so he could differentiate between those he sold and those he didn’t. 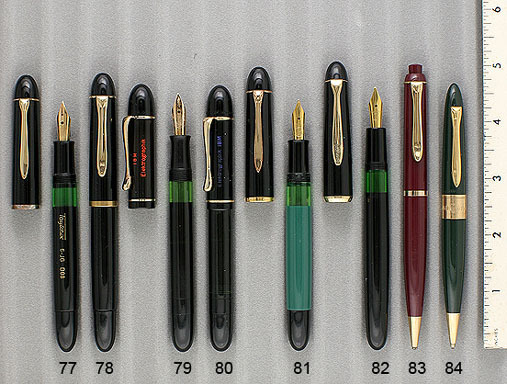 Among the pens he imported into Portugal was the “Magnum,” the only oversize 100N known to have been made. Pelikan continues to manufacture a variety of regular and limited edition writing instruments, which are still thought of as among the highest quality available in the market. 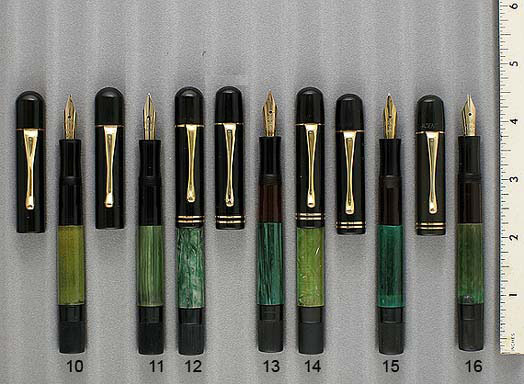 First Model (1929) Pelikans have 1 piece Bakelite barrels; long sections; black hard rubber caps with two vent holes, inner caps with parallel sides (cylindrical), and nibs with heart-shaped vent holes. The cap-top has Pelikan’s early logo with four birds in the nest. The model was not yet officially named the “100.” Produced until October, 1930. 1929 Pelikan 1st Model PIF in Jade. One piece Bakelite barrel. . GFT. Medium/broad, flexible, italic nib. Near mint. 1929 Pelikan 1st Model PIF in Jade. One piece Bakelite barrel. GFT. Fine, extra-flexible nib. Slight crazing of the binde, otherwise near mint. 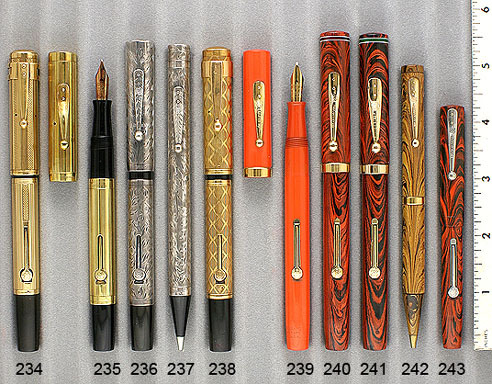 Second Model (November, 1930 to May 1931 Pelikans are identical to 1929, except for the addition of two cap bands and the introduction of the round vent hole in the nib. In early 1931 two additional vent holes are added to the cap (total of four). 1930 Pelikan 2nd Model 100 PIF in Bakelite with Mottled Jade binde. GFT. Medium, extra-flexible nib. Near mint. Third Model (June, 1931) has a streamlined cap-top The gripping section is still hard rubber, but the barrel is now amber Celluloid. Caps still have four vent holes. 1931 Pelikan 100 PIF “Emege” in Jade. Similar binde to that used in 1929. Near mint. 1931 Pelikan 100 PIF “Emege” in Jade. Similar binde to that used in 1929 and 1930. Medium, triple-flexible nib. Some mild typical discoloration of the binde, otherwise near mint. 1931 Pelikan 100 PIF in Jade. Similar binde to that used in 1929 and 1930. Extra-fine nib. Some mild typical discoloration of the binde, otherwise near mint. 1933 Pelikan 100 “Emege” PIF in Grey Marble (very rare). GFT. Medium/broad, flexible nib. New-old-stock. Mint. 1933 Pelikan 100 PIF in Blue (very rare). GFT. Broad nib, with a tad of flex. Near mint. 1933 Pelikan 100 PIF in Green Pearl. GFT. Medium nib. Near mint. Several available. 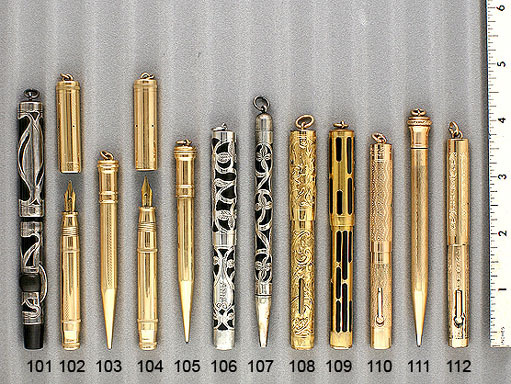 Ask for the nib you prefer. 1933 Pelikan 110 PIF in White Rolled Gold. Medium/fine, flexible, italic nib. Near mint. 1933 Pelikan 100 PIF “Emege” in Red Pearl (very rare). GFT. Medium, flexible nib. Near mint. 1933 Pelikan 100 PIF “Emege” in Blue Pearl (very rare). GFT. Fine, extra-flexible nib. Near mint. 1936 Pelikan 100 PIF in Black (rare). GFT. Fine, flexible nib, with an italic flair. Near mint. 1936 Pelikan 100 PIF “Emege” in Grey Marble (very rare). GFT. Medium/fine, extra-flexible nib. Near mint. 1935 Pelikan 209 Repeater Pencil in Green Pearl. Rare, short model. GFT. Green button, to be used with green lead (very rare). Near mint. 1935 Peikan 209 Repeater Pencil in Green Pearl. Rare, short model. GFT. Black button, to be used with black lead. Near mint. In 1937 the four-bird logo was changed to the two-bird logo. 1937 Pelikan 100 PIF “Emege” in Grey Marble (rare color). GFT. Medium, flexible nib. Near mint. 1937 Pelikan 100 PIF in Green Marble. GFT. Medium nib. New-old-stock. Mint in box. with Czechoslovakian Tax Seal, original labels on barrel, and instructions. Close-up of pen in box. In 1942 the Celluloid barrels were replaced with one-piece injection molded green acrylic barrels. Caps now have no vent holes. Cork gaskets were replaced with a synthetic black gasket. The turning knobs are no longer knurled. Production of the Model 100 ceased in 1944. The Model 100N was introduced in 1937 for export only, and in 1938 for the German market. 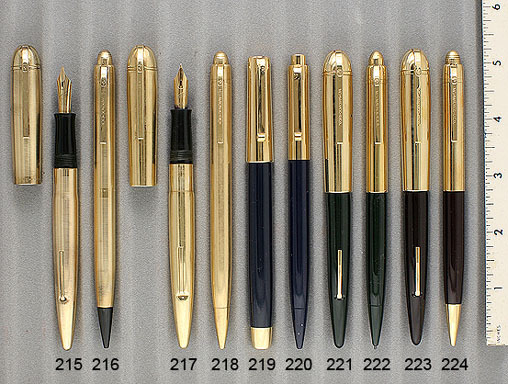 “N” stood for “New.” It was longer and wider and more streamlined than the 100 (most other manufacturers streamlined their pens years earlier). Early 100Ns have hard rubber caps. Until 1949 the section has a small step at the barrel end. The 100N was discontinued in 1954. 1937 Pelikan 100N PIF in Grey Marble (very rare). Amber Celluloid barrel. GFT. Medium/fine extra-flexible nib. Fitted with a 1953 gasket. Neat mint. 1938 Pelikan 200 Pencil in Grey Marble. GFT. Near mint. Matches pen above. Buy with pen above at $225. 1937 Pelikan 100CN PIF in Grey Marble (very rare). Green Celluloid barrel. Fluted clip and cap band. GFT. Stub, italic Chromium Nickel nib. Near mint. 1937 Pelikan 100N PIF “Emege” in Tortoise with rare “Long” Red Cap. The clip set higher on the cap made the pen more difficult to pickpocket. Amber Celluloid barrel. Medium, flexible nib. Some wear to the logo on top of the inner cap, otherwise near mint. 1937 Pelikan 100 PIF “Emege” in Tortoise with rare “Long” Red Cap. The clip set higher on the cap made the pen more difficult to pickpocket. A much rarer model than just above. Made in the Italian factory, with the integrated tortoise barrel with the amber Celluloid window. There is no separate sleeve! Extra-fine, flexible nib. Near mint. 1937 Pelikan Magnum PIF “Emege” in Tortoise with Red Cap. The “Emege” imprint is around the bottom of the inner cap. GFT. Medium/fine, flexible nib. Near mint. 1937 Pelikan Magnum PIF “Emege” in Tortoise with Red Cap. The “Emege” imprint is on the side of the cap tube. GFT. Medium, flexible nib. Near mint. 1937 Pelikan Magnum PIF “Emege” in Tortoise with Red Cap. The “Emege” imprint is on the side of the cap tube. GFT. Fine point. Near mint. 1937 Pelikan 101N PIF in Tortoise with red turning knob. GFT. Amber window. Fine nib with a tad of flex. Near mint. 1937 Pelikan 101N PIF in Tortoise with red turning knob. GFT. Green window. Medium, flexible nib. Near mint. 1937 Pelikan 101N PIF in Lizard with black turning knob. Amber window. GFT. Fine extra-flexible nib. Near mint. 1937 Pelikan 101N PIF in Lizard with black turning knob. Green window. GFT. Medium/broad nib, with a tad of flex. Near mint. 1937 Pelikan 100N PIF in Green Pearl. GFT. Made in the Italian factory, with the integrated tortoise barrel with the amber Celluloid window. There is no separate sleeve! Fitted with 1953 white piston gasket. Extra-fine, flexible nib. Near mint. 1937 Pelikan Still Available: 100N PIF in Green Pearl. GFT. Extra-fine/fine nib. Fitted with 1953 white gasket. Near mint. 1937 Pelikan 200 Repeater Pencil in Green Pearl. GFT. Near mint. But with any matching pen for $125. In 1942 the barrels became Acrylic and the gasket switched from cork to a black synthetic material..
1942 Pelikan 100N CN PIF in Black. GFT. Black synthetic gasket. Medium, extra-flexible nib. Near mint. The Chromium Nickel (CN) was used from 1937 until 1951. Extra-smooth, broad, italic nib. 1942 Pelikan 100N CN PIF in Green Pearl. GP fluted clip and cap band. Medium, flexible nib. Near mint. 1942 Pelikan 200 Repeater Pencil in Green Pearl. GFT. Fluted clip. Matches pen above. Buy with pen above at $125. 1942 Pelikan 100N PIF in Black. GFT. Medium, extra-flexible nib. Near mint+. 1939 Pelikan 201 Repeater Pencil in Black. GFT. Matches pen above. Near mint. Buy with pen above at $200. In 1953 the white plastic piston gasket was introduced. Many pens from 1942 onward have been fitted with the 1953 gasket because the earlier gaskets did not hold up well, even if unused. 1953 Pelikan 100N PIF in Black. GFT. Fine, flexible nib. Near mint. 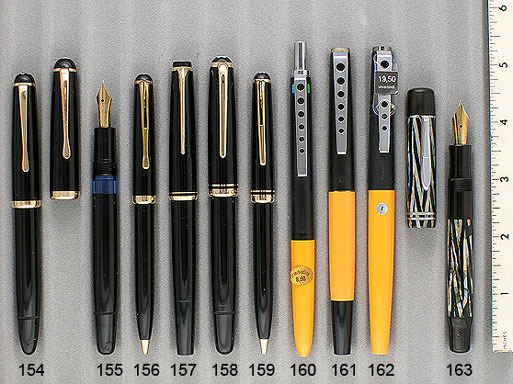 Ask for the nib you prefer. 1953 Pelikan 100N PIF in Green Pearl. GFT. Fine, flexible nib. Near mint. [Several available in different nibs, including double-broad flexible; medium-oblique flexible; fine extra-flexible; medium flexible; extra-fine; fine italic; broad oblique; others. Ask for the one you would like. 1953 Pelikan 100N PIF in Green Pearl. GFT. Incredible copperplate, fine, triple-flexible nib! Near mint. 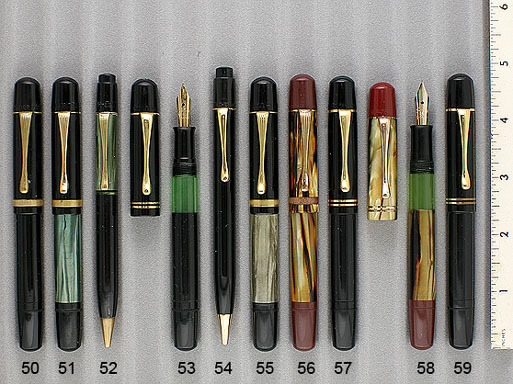 1954 Pelikan 100N PIF Prototype transition model, using the brown striped binde material found on the Model 400. Dated 1954 in Dittmer’s Pelikan book. Medium/fine nib. Near mint. 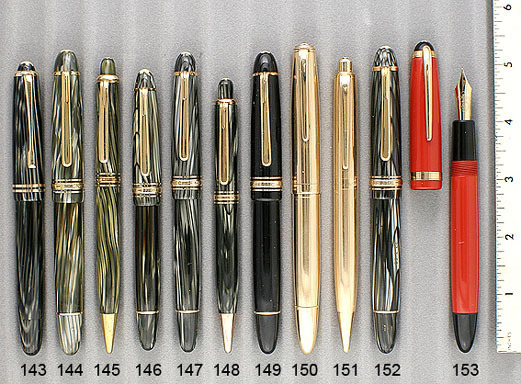 The Pelikan 400 (May, 1950 -1956) has a streamlined shape and, while the barrel of alternating color and transparent stripes, making the barrel visualated. Companion models include the 500, 520, 600 and 700. 1950 Pelikan 400 PIF in Green Stripe. GFT. Medium, oblique nib with an italic flair. Near mint. Several available with various nibs including: double-broad; broad; broad, oblique, flexible; fine; fine, flexible; manifold – double vented ($225). 1950 Pelikan 400 PIF in Brown Striped. GFT. Medium/broad nib with an italic flair. Near mint. 1950 Pelikan 400 PIF in Brown Striped. GFT. “KM” nib. The “K” is from the German word “Kugel” meaning ball, for a forgiving round ball tip. Near mint. 1950 Pelikan 450 Repeater Pencil in Brown Striped. GFT. Near mint. Matches the two pens above, as well as the two 400NNs below. Buy with any pen @ $75. 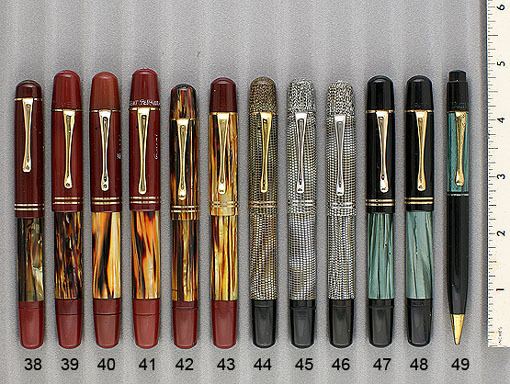 1950 Pelikan 500 PIF in Brown Striped with Gold-filled Cap and Turning Knob. Broad, flexible nib. User grade pen. While the outside of the pen is near mint, there are ink stains in the barrel (probably not even noticeable when you have ink in the pen). 1957 Pelikan 520NN PIF in fully Rolled Gold. Alternating wide barley and narrow plain panels. Visualated barrel. Medium/fine nib. Very clean, but sometime in its history it has been filled. Near mint. 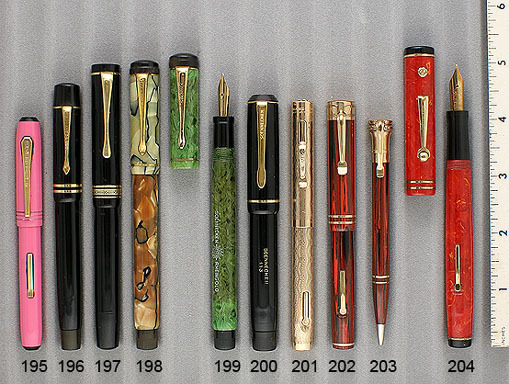 The Pelikan 400N (December 1955 – December 1956), was 5mm longer and has a more rounded turning knob. It is quite rare as it was produced for less than one year. 1955 Pelikan 400N PIF in Green Striped. GFT. A slight color change where the barrel is protected by the cap, otherwise near mint. 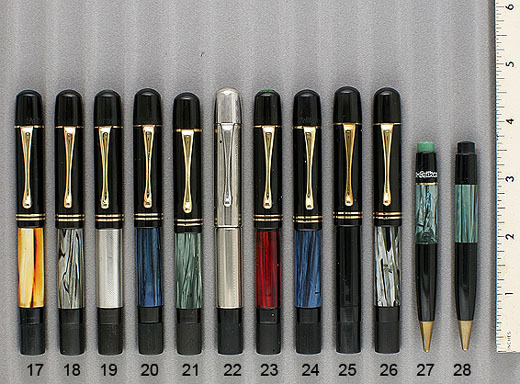 The Pelikan 400NN (April 1956 – July 1965) has a more streamlined cap top and turning knob. 1956 Pelikan 400NN PIF in Black. GFT. Medium/fine, flexible nib. Has the “Click Cap” feature which stops the cap from opening in the user’s pocket. Bottom lip of barrel signed “EXPORT.” Near mint. 1956 Pelikan Still available: 400NN in Brown Striped. GFT. Broad, oblique nib. Near mint. 1956 Pelikan 400NN in Green Striped. GFT. Medium, oblique nib. Near mint. 1952 Pelikan 140 PIF in Green Stripe. GFT. Near mint. [Four available. 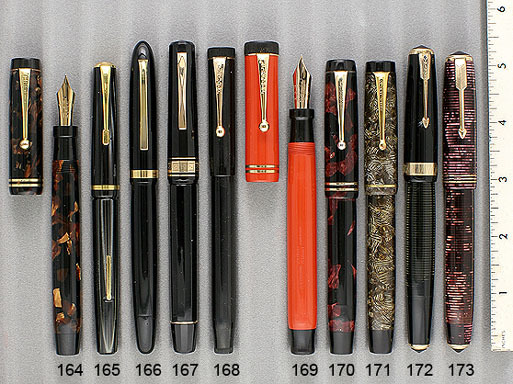 Other nibs include: medium, oblique; right-foot oblique, medium, flexible; double-vented manifold fine. 1955 Pelikan 355 Ball Pen in Green Stripe. GFT. Near mint. Matches pen above. Buy with any pen @ $60. 1952 Pelikan 140 PIF in Black. GFT. Extra-smooth, broad nib. Has the “Click Cap” feature which stops the cap from opening in the user’s pocket. Visualated barrel window. Near mint. 1955 Pelikan 140E PIF in Black (rare).. These pens were made to be used with special magnetic ink which could be read by electronic scanning equipment. Used for punch cards, bar coding, and student test taking (do you remember filling in the little circles on your multiple choice tests!?!). 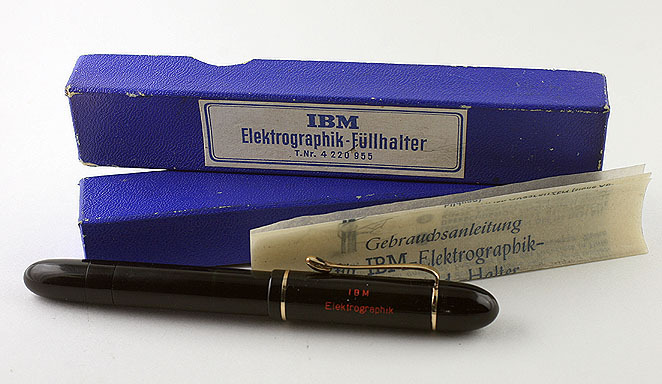 The cap is marked “IBM Elektrographik.” “DM” (medium, manifold) nib. GFT. Near mint+, other than one scar inside the visualated barrel window. Original box with instructions. Close-up of pen in box. 1955 Pelikan 140E PIF in Black. See information above regarding the use of this special pen. Some wear to the visualated window and the upper edge of the barrel lacquer. Excellent. 1973 Pelikan 120 PIF (Type II) in Black. GPT, 1mm (double-broad-nib. Visualated barrel. This model was produced by Merz & Krell for Pelikan. New-old-stock. Mint. 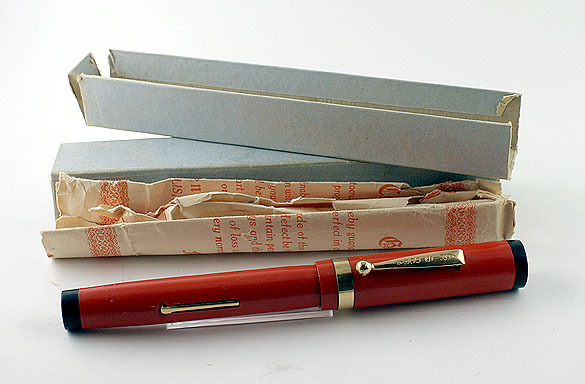 1952 Pelikan 350 Repeater Pencil in Red (rare). GFT. Near mint. 1953 Pelikan 60 “Knichbein” (bending leg) Repeater Pencil in Green. This is the famous Pelikan pencil which expels the lead by bending the pencil at its middle joint, like a bending knee. Designed to be done with one hand without interrupting writing. GFT. Neat mint. 1993 Montblanc Octavian LE 0758/4810. Medium point. Mint, sealed in original cellophane pouch, with original label, in box with papers and outer sleeve (file photo shown of the pen). 1993 Montblanc Agatha Christie Vermeil LE 0661/4810. Vermeil trim. Medium nib. Mint with original label, in box with papers and outer sleeve. 1994 Montblanc Louis XIV LE 0554/4810. Medium nib. Mint with original cellophane pouch, in box with papers and outer sleeve. 1994 Montblanc Semiramis LE 0545/4810. Medium nib. Mint in cellophane pouch, in box with papers and outer sleeve. 1994 Montblanc The Prince Regent LE 1009/4810. Medium nib. Still completely sealed in original shrink wrap (file photo shown of the pen). Mint with original label, in box with papers and outer sleeve. 1994 Montblanc The Prince Regent in 18K Solid Gold LE 593/999. File photo shown. Medium nib. Mint in sealed cellophane pouch, in box with papers and outer sleeve. 1997 Montblanc Catherine the Great LE 2094/4810. Medium nib. Mint, in box with outer sleeve. No papers. 1997 Montblanc Peter the Great LE 0484/4810. Fine nib. Mint in cellophane pouch, in box with papers and outer sleeve. 1998 Montblanc Alexander the Great LE 0689/4810. Medium nib. Mint with plastic sleeve, in box with papers and outer sleeve. [Two available, the second LE 0930/4810 with medium nib]. 1999 Montblanc Friedrich II the Great LE 1046/4810. Medium nib. Mint with original label, in box with papers and outer sleeve. 2000 Montblanc Karl Der Gross, Hommage a Charlemagne LE 0472/4810. Fine nib. Mint in box with papers and outer sleeve. 2001 Montblanc Marquis de Pompadour LE 3714/4810. Medium nib. Still completely sealed in original shrink wrap (file photo shown of the pen). Mint with original label, in box with papers and outer sleeve. 2003 Montblanc Nicolaus Copernicus LE 0930/4810. Medium nib. Mint with original label, in box with papers and outer sleeve. 2006 Montblanc Sir Henry Tate LE 3876/4810. Medium nib. Still completely sealed in original shrink wrap (file photo shown of the pen). Mint with original label, in box with papers and outer sleeve. 2007 Montblanc Alexander Von Humboldt LE 3005/4810. Medium nib. Still completely sealed in original shrink wrap (file photo shown of the pen). Mint with original label, in box with papers and outer sleeve. 2008 Montblanc Francois I LE 3841/4810. Medium nib. Mint with original label, in box with plastic sleeve, papers and outer sleeve. Marketed for watch chains, score keeping (i.e., Canasta, Bridge, Cribbage) hanging chatelaines, purses and, with a tassie, for dance cards. 1918 Conklin #2 Crescent-fill Ring-top in Sterling Silver “Art Nouveau Filigree” on BHR. Medium, flexible nib. Near mint. 1919 Parker Pencil for above set. 1920 Edward Todd #2 Eyedropper-fill Ring-top set in Sterling Silver “Filigree” pattern on BHR. Indicia engraved: “ANN.” Fine, extra-flexible nib. New-old-stock. Mint in original box. Close-up of set in box. 1920 Edward Todd Pencil for above set. 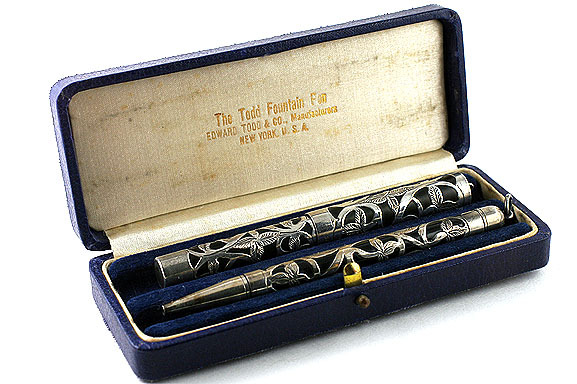 1918 Sheaffer #3 LF Ring-top in Gold-filled “Hand Engraved Vine” pattern on BHR. 1917 Sheaffer #2 LF Ring-top in Gold-filled “Night & Day” pattern on BHR. Quite a rare pattern. Fine, triple-flexible nib. No dents, dings or brassing. Near mint. 1920 Wahl Eversharp #2 LF Ring-top Set. In All Metal Gold-filled Engine-turned “wave chased” pattern. Fine, extra-flexible nib. New-old-stock. Mint in original box. Close-up of set in box. 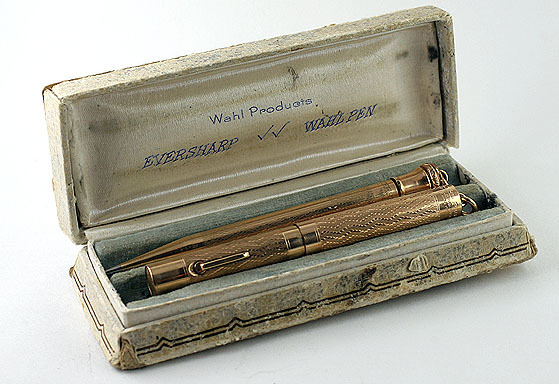 1920 Wahl Eversharp #2 LF Ring-top in Gold Filled “Christmas Bells” pattern (quite rare). Fine point. A tad of brassing along the bottom rim of the barrel, otherwise near mint. 1927 Anonymous #3 BF in Ivory with Black Veins. Most likely German made. GFT. The only marking is “4M on the blind cap. Extra broad, flexible nib. Near mint. 1910 Conklin 2NL Crescent-fill in BCHR. GFT. Medium, flexible nib. The slightest imprint wear (fully readable) otherwise near mint. 1918 Conklin 30 Crescent-fill in BCHR. GFT. Fine, flexible nib. The slightest imprint wear (fully readable) otherwise near mint. 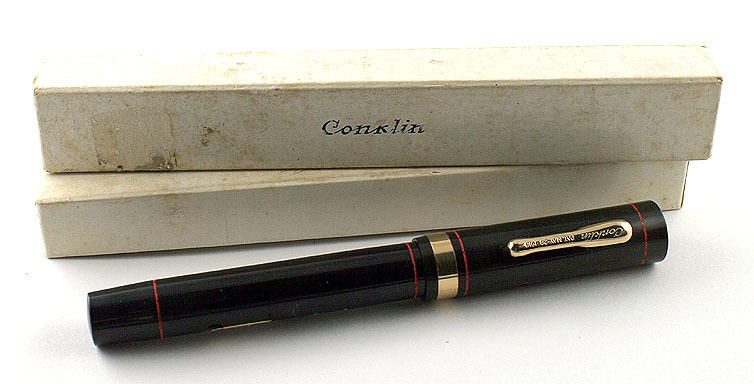 1927 Conklin Endura Sr. In Black Hard Rubber (much rarer than plastic). GFT. Medium/fine nib. New-old-stock. Mint in original box. Close-up of pen in box. 1927 Conklin Endura Standard LF in Sapphire Blue. GFT. Medium/fine nib. Near mint. 1920 Diamond Point #8 LF in Woodgrain Plastic. GFT. Set off nicely with orange bands at the black top and bottom. Medium “8" nib (really #6 size). Near mint. 1924 Dunn “Dreadnaught” #8 size Pump-fill in BHR with Red Casein bottom knob. GFT. Medium/fine nib, with just a touch of flex. A very large pen, in near mint+ condition. 1925 Franklin #8 Aristocrat LF in Cardinal with black ends (made to look just like the Parker Duofold!). GFT. Medium/broad, flexible nib. New-old-stock. Mint in original box with instructions (one end of box missing, the other torn). Close-up of pen in box. 1989 Lamy “2000" in Black Matte. Broad nib. New-old-stock. Mint. 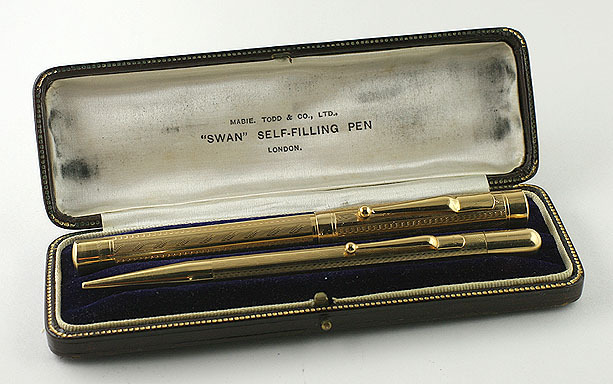 1920 Mabie Todd Swan 2 size LF Set in 18K solid gold. Much rarer than 14K! Design is alternating pinstripe (with periodic diagonal chasing) and wave chased engine-turned panels. Medium/broad italic nib, with a tad of flex. Near mint in original box. Close-up of set in box. 1920 Mabie Todd Pencil for above set. 1930 Montblanc 33 Twist Pencil in Coral Red (rare). GFT. Some small damage to the turning knob on the top of the pencil, otherwise near mint. 1930 Montblanc 33 Twist Pencil in Coral Red (rare). GFT. Near mint. 1934 Montblanc 17.5 push-knob filler in BHR. A rare model, with its non-knurled inner cap and smaller, inlaid star. GFT. Correct Montblanc “4" nib (medium, italic). Produced 1933 with “teardrop” clip and 1934 with “fluted” clip. Cap imprint a little weak (fully readable) and barrel imprint almost completely worn off. No brassing. Excellent. 1935 Montblanc 35 Masterpiece Push-knob filler in Coral Red (very rare). GFT. Medium/fine, flexible nib. Tiny bit of wear to the center of the barrel imprint (fully readable), otherwise near mint. 1935 Montblanc 20 Masterpiece push-knob filler in Coral Red. GFT. Has the signed Montblanc “teardrop” clip from the Model 2, which was produced at the same time as the Model 20. Extra-fine, flexible nib. A surface scratch here and there, otherwise near mint. 1935 Montblanc L71 Pix Repeater Pencil in BHR. GFT. Rare to find with the chased derby and center band. Beautiful crisp imprint and near mint+ condition overall. 1936 Montblanc Pix Repeater Pencil in six-sided 14K Streamlined. Barley pattern. Un-numbered (correct). Not stamped for gold content. The circle of gold on the push button which surrounds the white star inlaid into the BHR, is slightly out of round, otherwise near mint. 1937 Montblanc 134PIF in Black. GFT. Long visualated barrel window. Fine, flexible nib. New-old-stock. Mint. 1946 Montblanc 136 PIF in Black. GFT. Short visualated barrel window. Medium, oblique nib. Near mint. 1950 Montblanc 146 PIF Set in Silver Striped. This is a rare color variation of the silver stripe; the silver has a greenish tint and the pattern has more of a swirl. GFT. Extra-fine/fine, flexible nib. Slight barrel ambering, otherwise near mint. 1950 Montblanc Repeater Pencil for above set. 1950 Montblanc 144 PIF Set in Silver Striped. GFT. Fine, extra-flexible nib. New-old-stock. Mint. 1950 Montblanc 146 PIF in Black Celluloid. GFT. 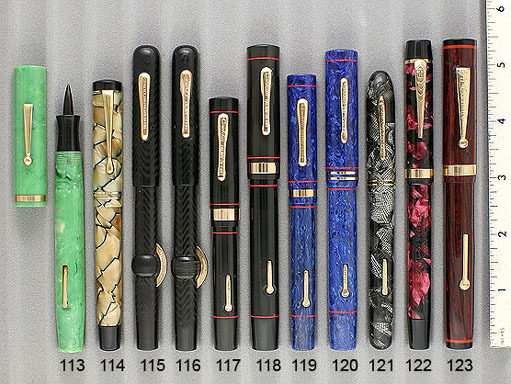 These early 14x series pens are far superior quality than the “precious resin” models produced today. Broad, flexible nib. Near mint+, could be new-old-stock. 1950 Montblanc 744 PIF Set in Gold-filled alternating pinstripes and plain panels. Visualated barrel. Broad, italic “Wing” nib. Two pin point dings near the turning knob and some minor surface scratches, otherwise near mint. 1958 Montblanc 315 “Clip Activated” Ball Pen in Black. GFT. Matches the two pens above. Buy with either pen @ $150. 1954 Montblanc 215 “Clip Activated” Ball Pen in Black. GFT. Matches pen above. Buy with pen above @ $150. 1975 Montblanc Carrera 4-Color Ball Pen in Yellow with Black Cap. CPT. New-old-stock. Mint with original label. Delivered with fresh refills (which are readily available in the US). Buy with either of the matching pens below @ $150. 1975 Montblanc Carrera cartridge/converter-fill in Yellow with black cap. CPT. Fine point (steel). New-old-stock. Mint with original labels. Converter included. 1935 Monte Rosa #4 size PIF in “Silver Ray.” An extremely “Art Deco” celluloid, similar to that used by Waterman in their Ink-Vue. Not affiliated with Montblanc, also often thought to be since Montblanc named their school line “Monte Rosa.” Perhaps Montblanc acquired the company??? GFT. Medium, flexible nib. The slightest amount of imprint wear (fully readable) otherwise near mint. 1932 Omas/ Minerva Minerva is a famous OMAS sub-brand. “Fetti” BF in Black & Bronze Patch (beautiful celluloid!). GFT. Duofold Sr look-a-like, as are all the earliest Minervas. Medium, flexible nib “Warranted” nib. Clip and barrel both signed “Fetti.” Near mint+. 1969 Omas “Gentlemen” 12-sided PIF in Black. One of the rarer Omas models. GFT. Three cap bands, with wide center “Greek Key” band. Medium, flexible nib. 1930 Parker Duofold Sr. BF in Burgundy Marble. GFT. Medium nib. Slight imprint wear, otherwise near mint. 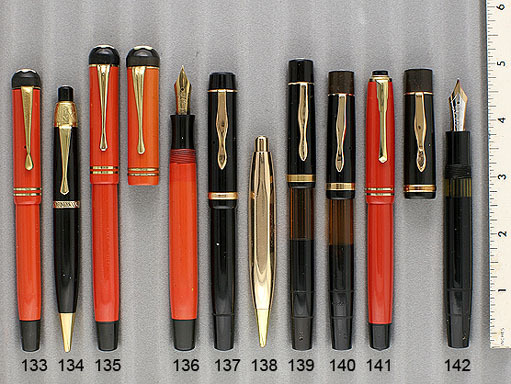 1935 Parker Oversize Vacumatic in Red Laminated. GFT. Canadian manufacture. Two-tone medium/fine nib. Near mint. 1940 Parker Challenger LF in Blue Marble (beautiful!). GFT. Medium nib with just a tad of flex for cushioning. New-old-stock. Mint. 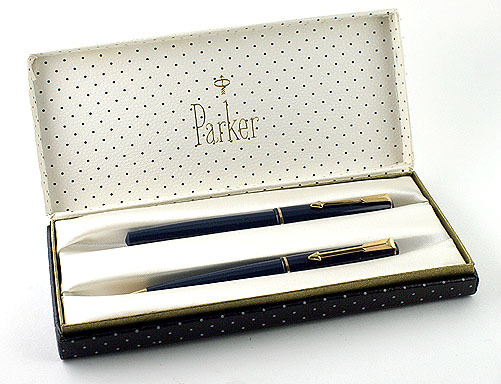 1964 Parker 17 “Lady” Aerometric-fill set in Blue. GFT. Has been dipped, but not filled (the plyglass bladder is still perfectly clear). Near mint + in original box. Made in England. Close-up of set in box. 1925 Pick #2 “Exceptional” LF Combination Pencil-Pen. GFT. Medium, extra-flexible nib. New-old-stock. Mint. 1917 Sheaffer #3 LF in Gold-filled on BHR “Gothic” pattern. Fine, triple-flexible copperplate nib. Near mint. 1925 Sheaffer Lifetime Flat-Top LF in Black. GFT. Extra-smooth, fine nib. Near mint. 1929 Sheaffer Lifetime Balance LF in Black. Unusual, extra-long, thin model, especially with the early “long, humped clip.” GFT. Fine nib. New-old-stock. Mint. 1937 Sheaffer Lifetime Balance LF in Grey Marble (one of the rarest Sheaffer colors!!). GFT. Visualated section. Fine point. New-old-stock. Mint. 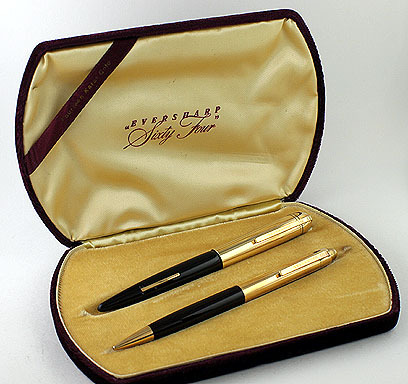 1938 Sheaffer WASP Clipper Oversize Plunger-fill Set in Golden Pearl Checkerboard with Black Stripes. Rare and beautiful! GFT. GF tassie on the top of the cap and bottom of the barrel. Medium nib. Our plunger-fill mechanisms are guaranteed to work for two years. Near mint+. Could be new-old-stock. 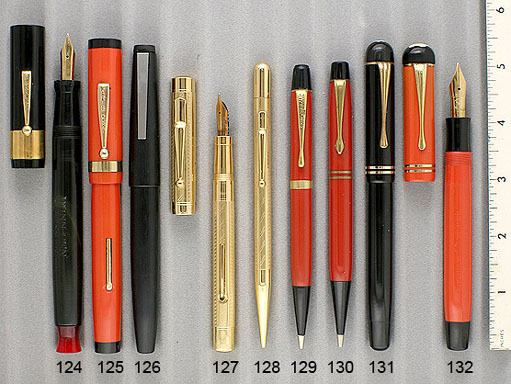 1938 Sheaffer Pencil for above set. 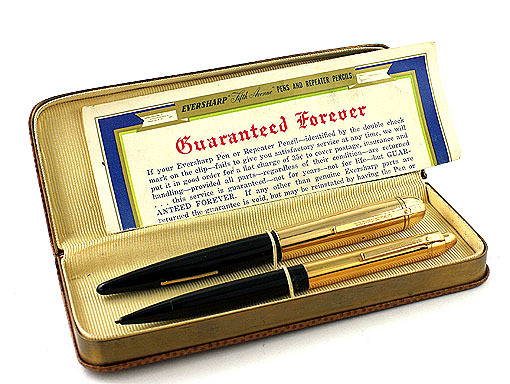 1949 Sheaffer Lifetime Triumph Masterpiece LF Set in 14K solid gold pinstriped. Medium/fine nib. Eng: “Clifford L. Marshall from Mono Associates 1949.” Near mint+ in original box with instructions (has been filled). Close-up of set in box. 1949 Sheaffer Pencil for above set. 1954 Sheaffer Admiral Snorkel in Burgundy. GFT. Medium/fine nib. New-old-stock. Mint with label in original box with instructions. 1954 Sheaffer Admiral Snorkel in Green. GFT. Medium nib. Near mint. 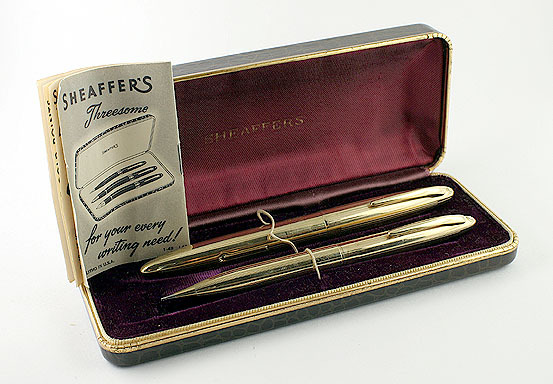 1959 Sheaffer PFM V in Burgundy with Gold-filled pinstriped cap. Medium “Ball” nib. Near mint. 1969 Sheaffer Targa #1054 cartridge/converter-fill in Black Matte. Medium/fine nib. Converter included. Near mint. 1945 Shirley Temple “Shirley Temple” LF in Pink. GPT. Medium, italic GP nib. Near mint. 1933 Soennecken Rheingold Spezial PIF in Black. GFT. Rare model, with three cap bands, two outer narrow bands surrounding a wide “Chain link” design band. Medium, extra-flexible nib. Visualated barrel. Near mint. 1927 Wahl Eversharp #2 LF Vest-pocket Set in Rosewood Hard Rubber. GFT. Fine, manifold nib. Rarer model, with what is called the “Crown” clip. Near mint. 1927 W’ Eversharp Pencil for above set. 1929 Wahl Eversharp Oversize Deco Band LF Set in Black & Pearl. Absolutely beautiful color! GFT. Medium, flexible nib, with an italic flair. New-old-stock. Mint in original box with original guarantee. Close-up of set in box. 1929 W’Eversharp Pencil for above set. 1929 Wahl Eversharp Oversize Deco Band LF in Woodgrain. GFT. Medium/fine, flexible “Gold Seal Signature” nib. New-old-stock. Mint. 1936 W’Eversharp Repeater pencil for above set. 1936 W’Eversharp Coronet Repeater Pencil in Brown with smooth Gold-filled cap. Rare model. Near mint. 1941 Wahl Eversharp Skyline Jr. LF in Green. GF horizontally chased cap, with rarer GF derby. Medium nib. Near mint. 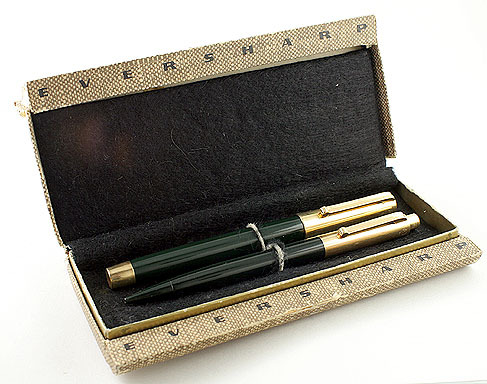 1943 Wahl Eversharp Fifth Avenue LF Set in Dark Green. 14K Solid Gold smooth caps. Medium/broad nib. New-old-stock. Mint in original box (box is threadbare). Close-up of set in box. 1943 W’Eversharp Repeater Pencil for above set. 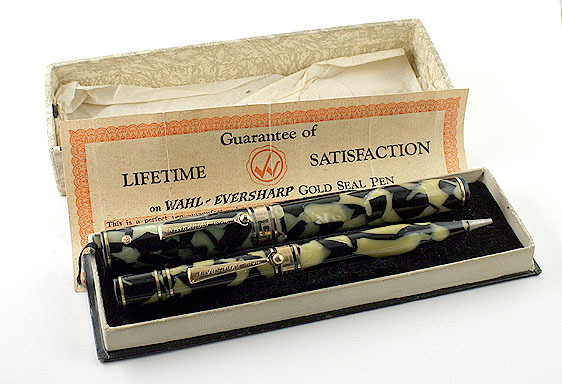 1943 Wahl Eversharp Skyline Gold Award LF Set in Vermeil. Marked as gold-filled, but brass was hard to get due to the war so Eversharp used Sterling Silver for the base metal. Medium nib. Two small dings, one in the derby and one at the very bottom of the barrel, otherwise near mint. 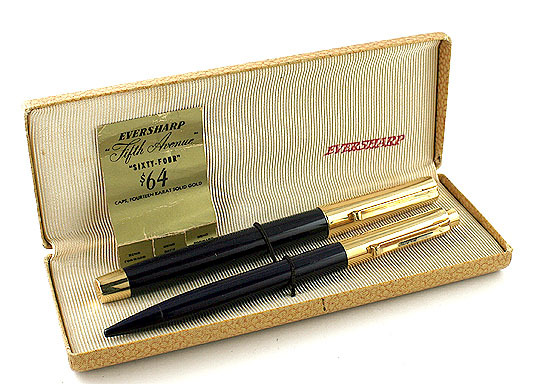 1943 Wahl Eversharp Skyline “Gift of a Lifetime” LF Set in smooth 14K Solid Gold. Pen barrel engraved: “Wesley W. West.” Fine nib. One barrel pinhead ding and some normal surface scratches, otherwise near mint. 1943 W’Eversharp Repeater pencil for above set. No barrel engraving. 1943 Wahl Eversharp Fifth Avenue LF Set in Dark Blue. 14K Solid Gold smooth caps. Medium/broad nib. New-old-stock. Mint in original box (box is a bit worn). Close-up of set in box. 1945 Wahl Eversharp Skyline LF Set in Green with smooth 14K solid gold caps. Extra-fine nib. New-old-stock. Mint in original box with Lifetime Guarantee. Close-up of set in box. 1945 W’Eversharp Repeater pencil for above set. 1945 Wahl Eversharp Skyline LF Set in Burgundy with smooth 14K solid gold caps. Medium/fine, flexible nib. New-old-stock. Mint in original box. Close-up of set in box. 1945 W’ Eversharp Repeater pencil for above set. 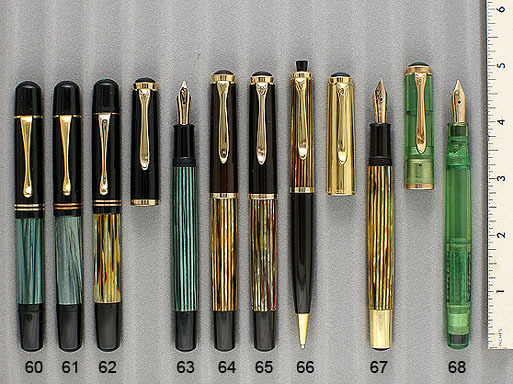 1931 Waterman 92 LF Set in Green & Bronze (beautiful!). GFT. Extra-fine, extra-flexible nib. New-old-stock. Mint. 1900 Waterman 20 Eyedropper-fill in Smooth BHR. Just the slightest imprint wear (fully readable), otherwise near mint+. There is some horizontal cracking on the left side of the nib, 1/4" up from where it enters the gripping section. Fine, flexible nib. If it wasn’t for this, the pen would be $2,000. 1905 Waterman 12 Eyedropper-fill in BHR. 1" wide 14K solid gold cap band sporting an engraved Coat of Arms in red, black yellow and silver enamel. The scroll at the bottom of the coat of arms reads “Deo Dante Dedi” (There is controversy over the correct translation, between “God giving, I gave” and "God having given, I give"). The coat of arms is the logo for the Charthouse School in Surry, England. The back of the barrel band is engraved “C. G. Leigh Hunt,” whom I can only assume was affiliated in some way with the school. Fine, flexible, italic nib. One cap lip crack, otherwise near mint. 1907 Waterman 22 Taper Cap Eyedropper-fill in BCHR. New-old-stock. Mint. Someone filled the barrel imprint with white. I will remove on request. 1910 Waterman #12 Sleeve-filler in BCHR. Rare model! The barrel sleeve slides down, revealing a bladder and pressure bar to be pushed with your thumb. Broad, extra-flexible, italic nib. Some light ambering, otherwise near mint. 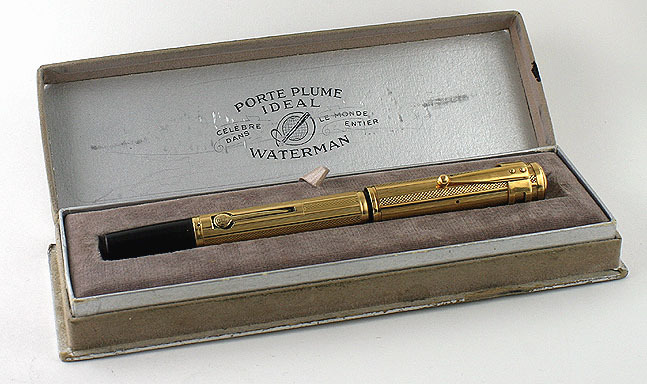 1920 Waterman 52 ½ LF in 9K Solid Gold “Line & Dot” pattern (very rare). Fine, flexible nib. Indicia engraved “W.C.P.” in script. Tiny stress marks at the very top of the barrel, otherwise near mint. 1920 Waterman 552 LF in 18K overlay on BHR. Pattern is alternating panels of fine pinstripe and barley. Broad, flexible nib. Signed Waterman accommodation clip is also 18K. No dents or dings. Crown seam a little uneven, otherwise near mint. Close-up of pen in box. 1920 Waterman 452 LF Set in Sterling Silver “Hand Engraved Vine” design. Fine, extra-flexible nib. Top cap edge slightly out of round, otherwise near mint. Will polish on request. 1920 Waterman Pencil for above set. 1924 Waterman 554 LF in 18K over BHR. "Croisillons" pattern (Diamond pattern formed in fine pinstripes). Overlay done by Waterman France. The accommodation clip is 18K as well. Fine, triple-flexible (copperplate) Indicia engraved, “D.B.” Near mint. 1925 Waterman 52 LF in Cardinal. Rare! GFT. Medium/fine nib. Barrel in a shade darker where protected by the cap, otherwise near mint. 1927 Waterman 7 “Brown” LF in Red Ripple. GFT. 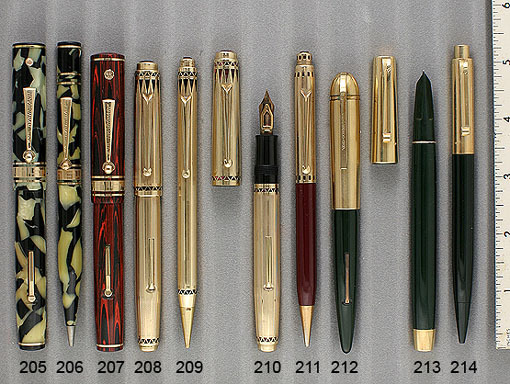 Early version, when the “Brown” color-coded nib represented a fine, flexible nib (later changed to a stiff nib). A tad of brassing to the clip ball, otherwise near mint. 1927 Waterman 7 “Green” LF in Red Ripple. GFT. Medium, manifold (stiff) nib. Gripping section is milled with a unique “pineapple” like crosshatch pattern. I don’t know if this was factory done. It serves to make the gripping section less slippery. Near mint. 1928 Waterman 94 Pencil in Olive Ripple Hard Rubber (rare). GFT. New-old-stock. Mint. 1928 Waterman 51V LF in Red Ripple (rare model). GFT. Medium, flexible nib. Perfect for your Day Planner or diary. Near mint+. Might be new-old-stock. 1929 Waterman Lady Patricia LF in Moss Agate (beautiful!). GFT. Fine, flexible nib. Near mint. 1930 Waterman #5 LF in Black. GFT. Rare non-color coded model. Fine nib, with a tad of flex. Near mint. 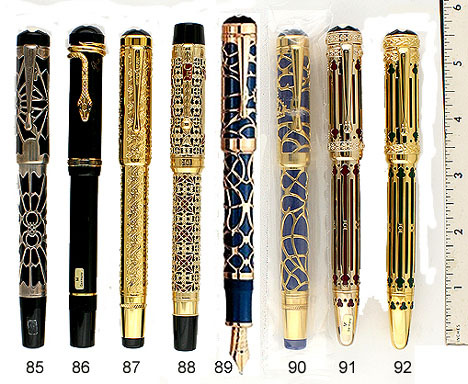 1936 Waterman 0552 LF Streamlined Set in Gold-filled “Basket-weave” design. Rare, later model, with “403" style clip. Has a very rare 2 size color-coded signed “Green” nib (medium, manifold). Indicia engraved “P.B.” Near mint+. 1941 Waterman 100 Year Standard LF in Black. Medium/fine, extra-flexible nib. Near mint. 1941 Waterman 100 Year Oversize in Black. GFT. Fine, flexible nib, with an italic flair. Near mint. 1941 Waterman 100 Year Oversize Pencil in Black. 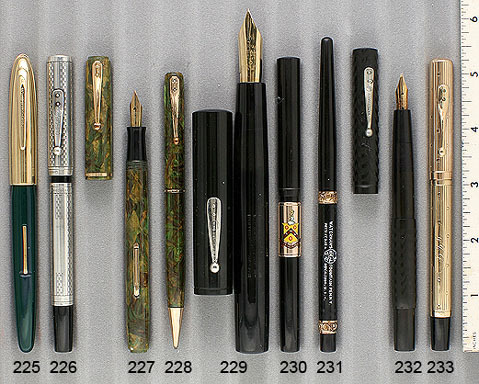 1942 Waterman Commando LF in Black. GFT. Fine, flexible nib with an italic flair. New-old-stock. Mint.